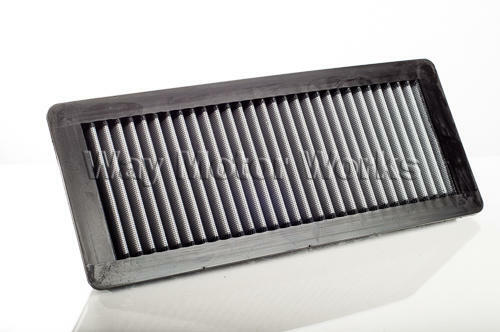 Dry Panel drop-in air filter replacement for 2007+ R55 R56 R57 R58 R59 MINI Cooper S Turbo. The dry filter is oil free making it the ideal replacement. Since these are oil free filters the MINI dealer can't void your warranty for oil buildup on the mass air flow sensor or other problem. Made from a synthetic material they have a significant increase in air flow over the stock paper. And much easier to clean as you don't need to worry about re-oiling them. These Dry flow air filters are a lifetime use filter so you can just clean it and reuse it. If you want to replace your stock air filter and do an upgrade this is a perfect solution. Excellent quality aFe filter, exhaust a tad bit louder, stickers and cleaning instructions are included!